//New York Times: "Writer and director Michael Walker teases out the proper mixture of psychological thriller and class satire." 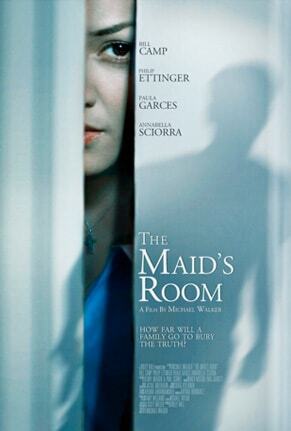 //LA Time: "Maid's Room' puts wealth and privilege on notice in a sly, satisfying thriller about class, status, violence." A Hitchcockian psychological thriller that explores the complex relationships between truth and justice, hubris and power, wealth and fear. Drina, a young immigrant girl is hired by the Crawford family as a live-in maid for their weekend house in East Hampton. One night Brandon, their son is involved in a hit and run. Drina unwittingly becomes the only person outside of the family to know that Brandon killed a man. The Crawfords are determined to cover the crime. Mr. Crawford is a powerful, smart man who is used to getting his way with people much more powerful than Drina, but Drina is unwilling to comply. The harder he tries to convince her, the more threatened she feels; the more threatened she feels, the more her life is at risk.